Spanning internal fixation (Ruch DS, JBJS 2005;87A:945). Pre-operative plan surgery using AO Technique based on pre-op P/A, oblique and lateral views. Ensure appropriate plates / screws, bone graft / bone graft substitutes are available. Reduction or fixation may be supplemented with Norion SRS cement(osteoconductive carbonated apatite) may be used as supplement. (Cassidy, JBJS 2003;85A:2127). 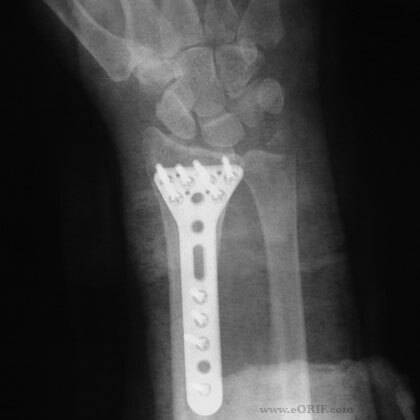 20° lateral c-arm views best shows lunate facet reduction (Medoff RJ, Hand Clin 2005;21:279). Supine position with hard table. Ensure appropriate C-arm images can be taken. Tourniquet placed high on the arm. Incision 10cm long, along the FCR tendon, zig-zagged over the wrist flexion crease. Dissection with 2.5/3.5 loop magnification. Dissect distal to the superficial radial artery. Ensure artery is preserved. Incise floor of FCR tendon sheath. Develop plane between FPL and the radial septum exposing the pronator quadratus. Release pronator quadratus with a distally based L-shaped incision exposing volar surface of distal radius. Irrigate and debride fracture site. Extended exposure can be achieved by pronation of the proximal fragment and/or opening the first extensor comparmtne and retracting the APL and EPB tendons or performing a step-cut release the of the brachioradialis insertion. Fixation provided as described by manufacture technique guide using AO techniques. Varify reduction and screw position flouroscopically. Images with beam inclined 20 degrees from distal to proximal are key to confirm articular reduction. Evaluated DRUJ stability after fracture fixation and compare to uninjured side. Repair pronator quadratus over the plate. Post-Op: Place in volar splint. Encourage digital ROM, elevation.